When hot weather starts coming around we all are constantly pulling our hair back to get it up and away from our faces. As a child and until I was in high school I always had long, thick hair that fell all the way down my back. It's still thick but much shorter now. Then my go to method for pulling my hair up was a classic ponytail. This was easy and quick. But honestly, that typical, classic ponytail is not very stylish. So why not update that look with one of these for options above? Side Topsy Ponytail- This style is as easy and simple as the most basic ponytail, but looks so much better. It has become my go-to ponytail. 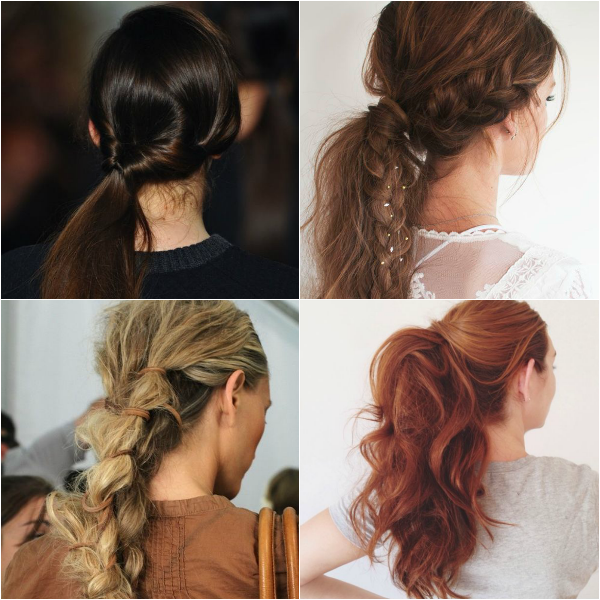 Ponytail with a Braid- Why not up the classic ponytail with a big braid in it or several smaller ones? Messy Braided Ponytail- This is a messy chic look. I love it, what about you? High Messy Ponytail- I love how this ponytail incorporates part of your hair to wrap around and hide the actual ponytail holder. Don't you? What hairstyle do you rock when the weather is unbearably hot? These looks are perfect! I want to try them all!